Karnataka is a state in south western region of India. It was formed on 1 November 1956, with the passage of the States Reorganisation Act. Originally known as the State of Mysore, it was renamed Karnataka in 1973. The capital and largest city is Bengalore/ Bengaluru is known as the silicon valley of India. The state covers an area of 191,976 square kilometres (74,122 sq mi), or 5.83 per cent of the total geographical area of India. It is the seventh largest Indian state by area. Karnataka is a state in south western region of India. It was formed on 1 November 1956, with the passage of the States Reorganisation Act. 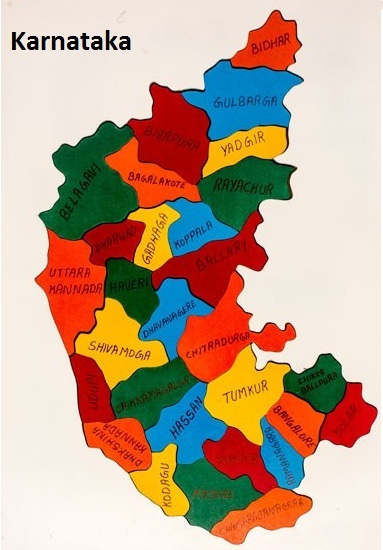 Originally known as the State of Mysore, it was renamed Karnataka in 1973. The capital and largest city is Bangalore/ Bengaluru is known as the silicon valley of India. The state covers an area of 191,976 square kilometres (74,122 sq mi), or 5.83 per cent of the total geographical area of India. It is the seventh largest Indian state by area.